JUST LISTED with First OPEN HOUSE! Go Ahead, Fall in Love with this Gorgeous Home! - Shannon Doser Group and Assoc. This gorgeous home was JUST LISTED and we will be hosting the First OPEN HOUSE this weekend! 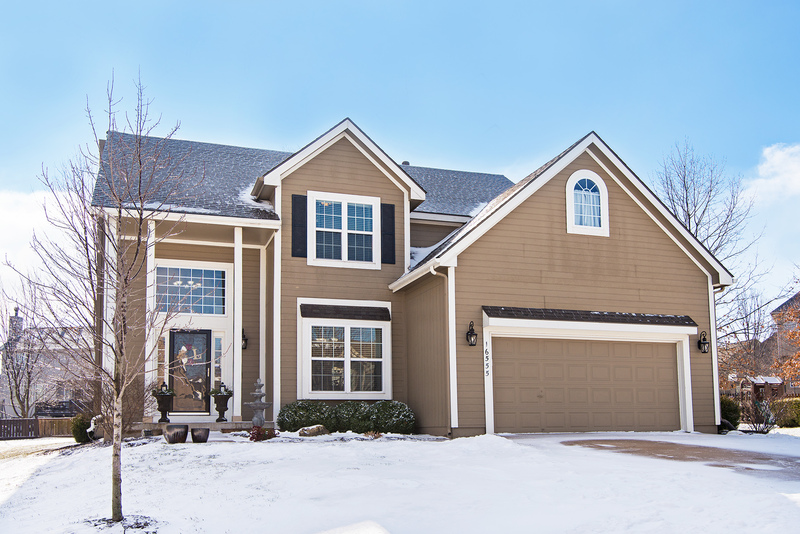 Welcome home to 16555 W. 155th Place in the Parkside at Arlington Park community of Olathe. This gorgeous home is sited on a cul-de-sac lot and offers four bedrooms, two full and two half baths, and 2,837 square feet of living space. Some of the many highlights include an updated kitchen, upgraded master and hall baths, newer HVAC, newer light fixtures and fans throughout, newer roof, fresh interior paint, new water heater, newer sliding glass door and wrought iron spindles! Be welcomed home by a 2-story covered front porch inviting you into the soaring hardwood foyer. To your right is the formal dining room offering wide crown moulding, recessed tray ceiling with chandelier lighting, and a large window overlooking the front yard. Continue to the great room highlighting a cozy fireplace, built-ins, refreshing lighted ceiling fan, wide crown moulding, and large windows overlooking the back yard and deck. The great room opens to the stunning and updated eat-in kitchen highlighting beautiful hardwood floors, abundant beautifully painted cabinetry, granite counters, newer undermount sink and faucet, a breakfast bar, full tile backsplash, pantry, and built-in desk. Appliances include the microwave, smooth surface range, dishwasher and disposal. The eat-in breakfast area has chandelier lighting and a newer sliding door leading to the deck. You will love the easy flow of these incredible spaces. Also on the main level are the laundry room located off the kitchen, plus the powder room featuring hardwood floors. Ascend the stairs with beautiful wrought iron spindles to the bedroom level. The sophisticated master suite offers soothing colors, vaulted ceiling with refreshing lighted ceiling fan, walk-in closet, and spectacular private bath with vaulted ceiling, his-and-her granite vanities, relaxing soaking tub with tile surround, and a separate gorgeous walk-in frameless glass and tiled shower. Also on this level are three additional bedrooms, each with vaulted ceilings and lighted ceiling fans, and the upgraded full hall bath with double vanity, ceramic tile flooring, and a shower over tub. Downstairs, the full finished lower level features a family room and media area perfect for entertaining, and the second half bath. Outside, the entertaining continues on the large composite deck overlooking the backyard with mature trees and kid’s play swing-set. Additional features include central heating and air, a humidifier, an in-ground sprinkler system, several TV wall mounts, and an attached 2-car garage with opener and keyless entry.